The process of learning a new language is always challenging. Some ESL students have a natural talent to grasp the grammar and vocabulary aspects of English language, but most of them have serious problems to fit into the new environment. Although educators are getting better in motivating students to have a more enthusiastic approach towards learning, they still face serious challenges to infuse educational technology into the curriculum for the appropriate level. But you don’t have to wait for your teachers’ recommendations to start relying on apps, websites and tools that will help you become fluent in English essay writing in no time! The following list of tools is the right place to start. 20-Minute ESL Lessons – As an ESL learner, your primary goal is to work on your vocabulary. This aspect takes a lot of time and effort, since you need to understand how to use each new word in daily situations. At this website, you will find homework sheets accompanied with listening and discussion activities. The system also enables you to keep track of your progress as you build your communication skills. Write My Essay – This is an immensely helpful resource for ESL students who need assistance with essays, theses, research papers, and other types of projects. Foreign students don’t have it easy; they have to write just as well as natives if they want to reach their goals of academic success. Luckily, custom writing service Ninja Essays enables them to hire trained writers with degrees in several areas of study. 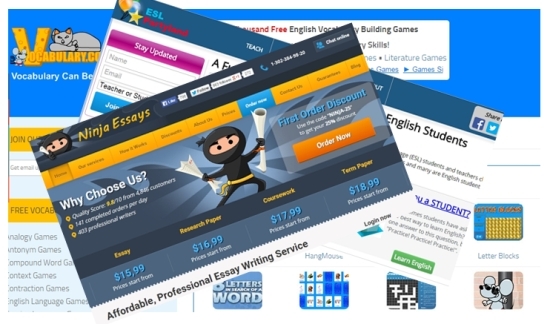 The company also offers editing assistance, as well as free tips and guides on essay writing. ESL Partyland – The festive name of this website is self-explanatory: it enables you to learn through fun activities. You can practice reading and writing through various exercises that won’t make you intense. In addition, ESL Partyland is a great source of external sites that will enable you to improve your arsenal of educational tools. Purdue OWL – This website is one of the most important resources for English language learners. It provides a great number of linguistic primers and practice sheets for all levels. The section for ESL Instructions and Students provides access to grammar and mechanics lessons, as well as guides for plagiarism and academic integrity, and workplace writing. 5-Minute English – This is a cool website that offers effective exercises and lessons, which make learning as fun as possible. The explanations may be short, but they are on point when it comes to clarifying the most confusing aspects of the English language. 5-Minute English also provides links to helpful books, programs, and other resources for ESL learners. English Gateway – Once you go through an important grammar or vocabulary lesson, you can download an ESL worksheet at this website and test whether or not you’ve understood the concepts well. The worksheets enable you to verify your grasp of phrasal verbs and collocations, as well as idioms. Vocabulary.co.il – Believe it or not, learning new English words can be fun. This website enables you to make the process more fun by playing flash online word games, such as hangman, crossword puzzle, word search, typing games, synonym games, and more. BBC Learning English YouTube Channel – BBC is a great website for ESL students, but its YouTube channel is even more effective. The video presentations include grammar, vocabulary and pronunciation lessons. However, you can also learn through fun videos that present news, celebrity info, or interviews. You’ll love “The Flatmates” – the world’s best ESL soap opera. Vocaboly – At this website, you will find several vocabulary tests that will enable you to evaluate your knowledge and skills. In addition, you can make your own tests if you download the vocabulary builder. Online tools are a necessary part of today’s education. ESL students can master the nuances of tense and grammar by relying on the resources listed above. Robert Morris is an educator, writer and SAT tutor from NYC. He is fond of online education and helps ESL students with language learning. Follow Robert on Google+!